Another blissful day of keeping the peace in highsec. Miners, if you want to relax, give miner bumping a try. Suddenly, out of nowhere, an illegal Retriever appeared in my ice anomaly. I could tell he was up to no good. Luckily, I knew just how to handle him. Nkomo James was baffled by what was happening. He lost control of his ship and began drifting away from the ice--the very same ice that he had planned to steal. Nkomo had never experienced the awesome power of the bump. Gradually, it dawned on him that I had complete control over his ability to mine. They never explained that in the tutorial! 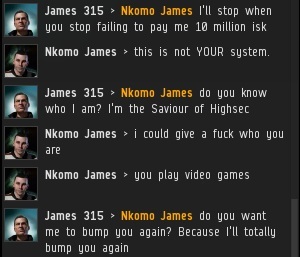 For some reason, Nkomo had little respect for people who play video games. 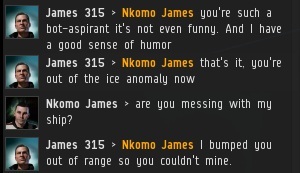 He reminded me of the people who mine in highsec but don't consider themselves highsec miners. 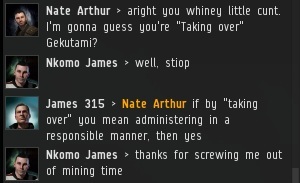 This whole "I paid CCP my subscription fee, therefore I shouldn't have to buy a mining permit" meme is getting out of control. 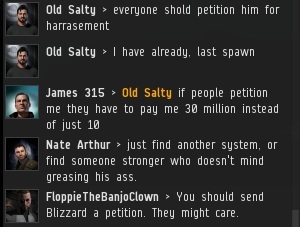 Try taking that attitude to Jita. I wonder how many will give you free ships and modules on the basis of your already having "paid to play"? But Nkomo wasn't really that interested in hearing what I had to say. Once I began to explain myself, he hastily exited the convo. As Nkomo's Retriever disappeared into the distance, he finally realized he was beaten. He retreated to the nearest station and docked up for the day. The miserable mass of rebel miners docked up and huddled together. 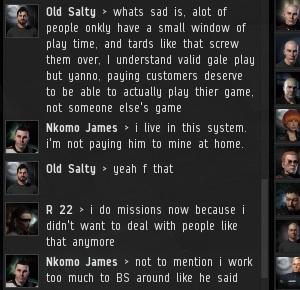 Old Salty was bitter about being forced to "play someone else's game". 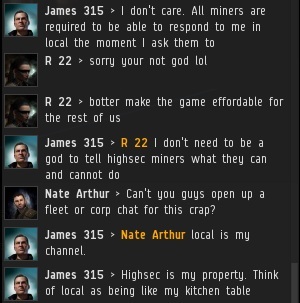 Although I do require miners to follow my rules, let's not forget that there's a whole world outside of highsec. Those who wish to "play their own game" are free to mine in lowsec, nullsec, or wormsec. And if they get fired upon, let them give their attackers that line about paying CCP for mining rights. James must be a 350 lb plus lonley little man living in grandmas basement and is taking out all of the bullying he has suffered in real life out on players in a game. Did you buy a permit? You got it wrong OP, James play by the rules and enforces his control over the system, so the carebears bully him with insults and threats. Anon 1816 - Outside of the film "Gamer" I have never seen a morbidly obese gamer. Sadly you only have personal attacks left to you, our fellow gamer, perhaps you could try to unlearn the three lives and game over rule. 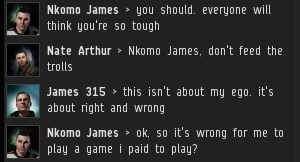 This is Eve, a pay to play game that with foolish decisions, stupidity or just plain altruism can mean you are left asset-less, isk-less and homeless, martyred by your own hubris. 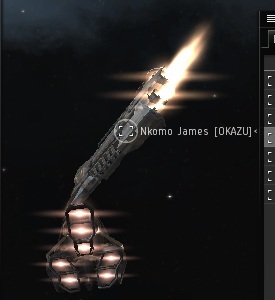 I've started to realise why the ISK amount has been kept so low. Its a sandbox that allows you to make great wealth or make nothing. 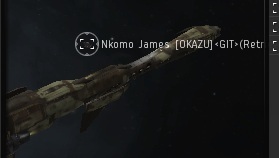 Respect that ccp have made a great mmo that allows free game play. I built my toons up over several years with hard work and at the keyboard play. 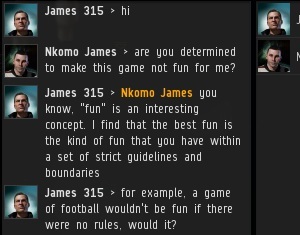 All the new order and james want, is for RL toons to have fun and be at the keyboard playing EVE. 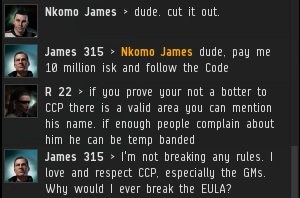 So if you cant make it in eve Daniel, its down to no ones fault but your own. End of the day many of us indy players don't agree with all what the new order want Daniel. But we learn to adapt to survive the new order. So either you must learn to adapt, or go find a mmo game that allows you to play the style you want. I personally can't even think about ganking without knowing the hot pocket inventory is adequate. Replying to the actual comment works much better than starting a new one. "I have never seen a morbidly obese gamer"
That's because they are morbidly obese and don't leave their basement. Either that or you don't leave your basement. NMWU, EVE is a sandbox for every player, not just for miners. And that's why James can use his power to control your gameplay. You can do everything you want if you go by the rules, and he does. That's the point of a sandbox.